We offer 4 in 1 Foldable Treadmill which is a range of marathon equipment. It is designed specially for aerobic workouts to satisfy the requirements of long distance runners. This treadmill caters to the requirements of professional athletes. We are the suppliers and these can available to our clients in Chandigarh, Mohali, Panchkula, Haryana, Punjab, Himachal Pradesh or Entire North India. Manual Treadmill: Beautiful dash board with electronic meter having functions of scan, speed, distance, calories, time Provision of two different levels easily adjustable, which helps to walk or jog on same machine. Foldable easy to store & wheels for easy portability. 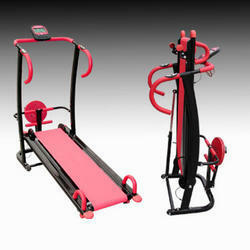 With a firm commitment to quality, we are involved in offering a wide ambit of Foldable Gym Treadmill. Dimension: 73(W) x 157(L) x 123(H) cm.